Chinese President Xi Jinping, left, holds a welcoming ceremony for North Korean leader Kim Jong Un before their talks in Beijing on Tuesday, Jan. 8, 2019. 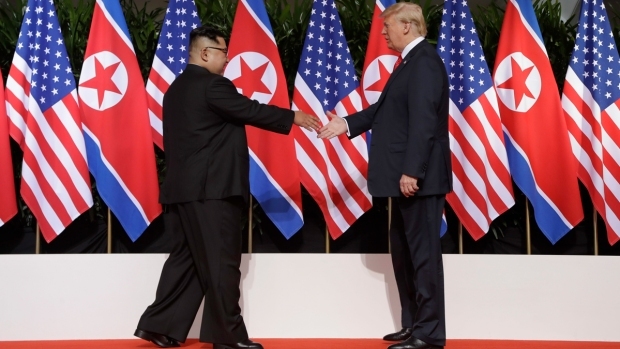 North Korean leader Kim Jong Un has reportedly told the leader of his only major ally, China, that he wants to "achieve results" on the nuclear standoff on the Korean Peninsula during a second summit with U.S. President Donald Trump. The comments, contained in Chinese state media reports Thursday, came a day after Kim left Beijing on his special armored train after a two-day visit to the Chinese capital. Kim's trip to China — his fourth in the past 10 months — is believed to be an effort to coordinate with Beijing ahead of a possible second summit with Trump. It comes after U.S. and North Korean officials are thought to have met in Vietnam to discuss the site of the summit. South Korean President Moon Jae-in is urging North Korea to take bolder disarmament measures that the U.S. should then reward, suggesting Thursday he wants harsh sanctions lifted so Seoul can eventually restart dormant economic cooperation projects with its neighbor. "North Korea knows it needs (to take) clear denuclearization steps to see international sanctions lifted and the United States also realizes that reciprocal measures are needed to match these North Korean denuclearization steps," Moon said at a news conference. Kim was quoted in China's official Xinhua News Agency as saying North Korea will "make efforts for the second summit between (North Korean) and U.S. leaders to achieve results that will be welcomed by the international community." All sides should "jointly push for a comprehensive resolution of the Korean Peninsula issue" and North Korea will "continue sticking to the stance of denuclearization and resolving the Korean Peninsula issue through dialogue and consultation," Xinhua quoted Kim as saying. 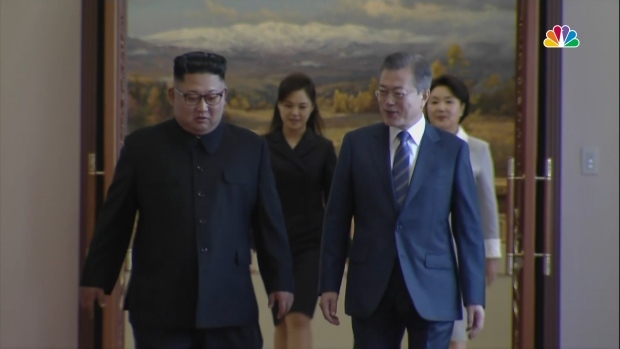 Kim also said North Korea hopes its "legitimate concerns" will be given due respect, a reference to its desire for security guarantees and a possible peace treaty to formally end the 1950-53 Korean War. He also credited Chinese President Xi Jinping with helping reduce regional tensions, saying "the Korean Peninsula situation has been easing since last year, and China's important role in this process is obvious to all." The North's Korean Central News Agency reported that Kim told Xi that the North remains unchanged in its push to seek a negotiated resolution of the nuclear standoff. It said Kim also mentioned unspecified difficulties in improving ties with the United States and moving nuclear diplomacy forward. Xi was quoted by Xinhua as saying that China supports the U.S.-North Korea summits and hopes the two sides "will meet each other halfway." KCNA said Xi accepted an invitation to visit North Korea, although details of when he might go were not given. It wasn't clear from the reports if Kim was in back in North Korea, but his train presumably would arrive sometime Thursday. Xi has yet to visit North Korea since taking office in 2012. 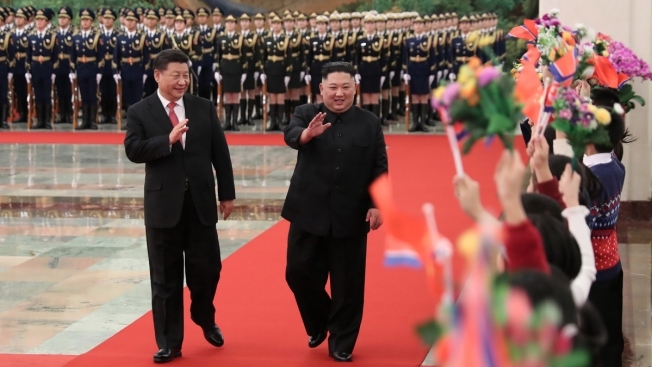 Kim's Beijing visit was seen as part of an effort to win Chinese support for a reduction of U.N. sanctions imposed over his nuclear weapons and ballistic missile programs. The sanctions have severely impacted his country's already ailing economy. While North Korea hasn't conducted any test launches or detonations in more than a year, it has displayed no real intention of abandoning the programs that are seen as guaranteeing the government's survival. The trip also came after he expressed frustration in his annual New Year's address over the lack of progress in negotiations with Washington since the Singapore summit, saying that if things don't improve — meaning that if sanctions relief and security guarantees aren't in the offing — North Korea might have to find "a new way" forward. While Trump says he considers Xi key to enticing Kim into taking concrete steps toward denuclearization, the president's own relationship with his Chinese counterpart has frayed over the U.S.-China trade war. Officially, at least, China says it considers the tariff battle and North Korea's weapons programs to be entirely separate. KCNA reported that Kim on Wednesday visited a pharmaceutical plant belonging to Beijing Tongrentang Co. Ltd., where he watched production processes. It said he met with Xi at the Great Hall of the People on Tuesday after a welcoming ceremony. Later Tuesday, Xi gave a grand banquet for Kim, his wife Ri Sol Ju and other visiting North Korean officials. At Tuesday's daily Chinese foreign ministry briefing, spokesman Lu Kang said Beijing remains supportive of efforts to end tensions over U.S. demands for a halt to North Korea's nuclear and missile programs. "We always believe that, as key parties to the Korean Peninsula issue, it's important for the two sides to maintain contact and we always support their dialogue to achieve positive outcomes," Lu said. Tuesday was Kim's birthday but there was no word of any official celebration. Associated Press writers Foster Klug and Hyung-jin Kim contributed to this report.